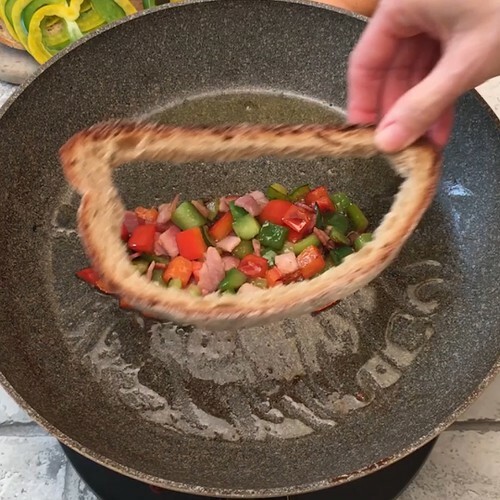 Using a knife, cut the middle out of the bread to leave you with just the crust. Cut the peppers and the ham into small pieces. In frying pan, cook the peppers and ham in a little oil. Push ¼ of the mix together to form the shape of the bread crust, then place the crust over the top around the ham and pepper mix. Beat an egg and pour it over the ham and peppers in the middle of the bread. Add the grated mozzarella on top and cook for 3 minutes. Place the middle of the bread on the cheese, and using a spatula, flip the omelette over. Cook for 2 - 3 minutes on the other side. Repeat the process with the other 4 slices of bread and enjoy hot.